It seems I'm back in the sewing mania. First I finished two easy appliqué. The skull is my UFO since spring. It's Monster High logo if you not familiar with such thing and it was requested by MiniMe herself. I was also able to finish Barbie bag. It's my entry to Purse Palooza. It's quite simple pattern. Front panel with appliqué, back panel and side panel. Inside the bag there is small pocket and zipper pocket on the other side. It can be worn as purse on the shoulder or as a messenger bag across the body. I haven't followed any particular pattern but if you would like to give it a try I would recommend this one - click. As I was in the sewing mode last night I decided to join Holiday Memories Quilt competition over at Celtic Thistle stitches. I had no idea what to make when I first read about it but it just clicked in my head last night. It usually does on the last day. I do like such challenges and my piece represents sun, sea, sand. That's a combination we are usually looking for when it comes to holiday. We were on our first family vacation in Turkey this summer and it fulfilled our expectations for sure. There was plenty of sun, plenty of sand and beautiful sea as well. Since I'm not very keen on yellow the sun is represented by the quilting spiral and the bright zipper on the back. I used Essex linen in ivory shade for the sand and lt. blue and dusty blue for the sea part. I was making mini at first that's why it has that funky print on the back side but today I changed my mind and turned it into pillow instead. Size: 12.5 x 12.5"
I'm quite happy with the curves. Perfectly hidden yellow zipper, lol. Since it's Friday I'm also linking up with TGIFF and Crazy mom quilts. Love your cushion the quilting is just perfect. Thanks for linking up to the competition too. I love the spirals on your pillow! Great job on all your projects! The barbie bag rocks. I want one. It's pretty easy to make. I'm sure you'll manage, wink. I want a barbie bag!! Wait - I probably have one. We love barbie around here. :) Beautiful work! I love the quilting on the novelty print (it's a shame it won't be seen), but I also love how the other side looks like the sun reflected off of ripples in the water. I really like the pillow especially the quilting oh and the wavy Color blocking. I love your cushion - the colours are beautiful. I love the pillow and the quilting! 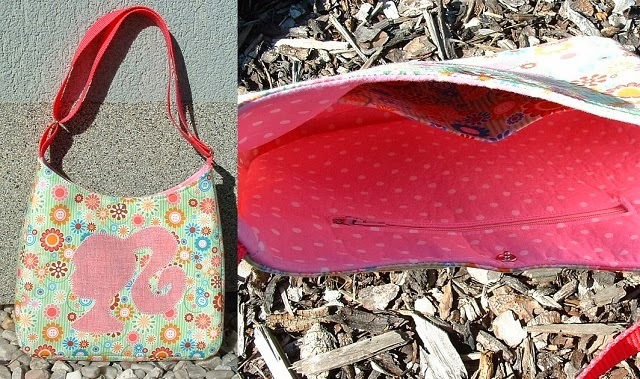 Barbie bag is charming, and the cushion is sophisticated and beautiful. Well done! Your cushion is fantastic! Love the spiral quilting and i must learn how to do that hidden zipper! Love your quilting and how you've joined the fabric with curves. A great cushion! I love your bag! The applique looks very vintage. Your cushion is lovely too! That Barbie bag is cute as a button! And the pillow is so chic! thanks for the link of a great tutorial!! Okay, I just LOVE that pillow!! This weekend, I am unashamedly going to copy it. Thank you for the inspiration, yellow thread & all.